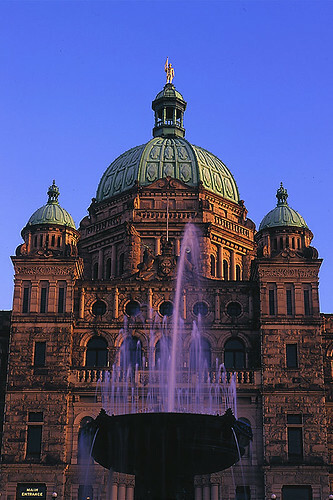 The Greater Victoria region covers the extreme southern end of Vancouver Island, British Columbia, including the Saanich Peninsula, Victoria, Esquimalt, Colwood, Metchosin, and Sooke, with almost half of Vancouver Island’s population of 750,000 people living within the Capital Regional District (CRD) around Victoria. 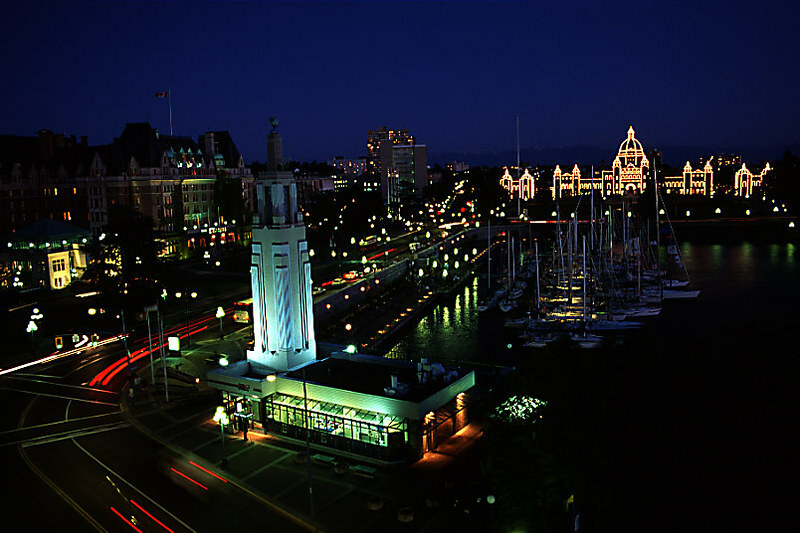 Established in 1843 by James Douglas as a Hudson’s Bay Company Fort, the City of Victoria has a proud history of British custom. Victoria has a temperate climate with mild, damp winters and relatively dry and mild summers. It is sometimes classified as a cool-summer Mediterranean climate due to its usually dry summers. 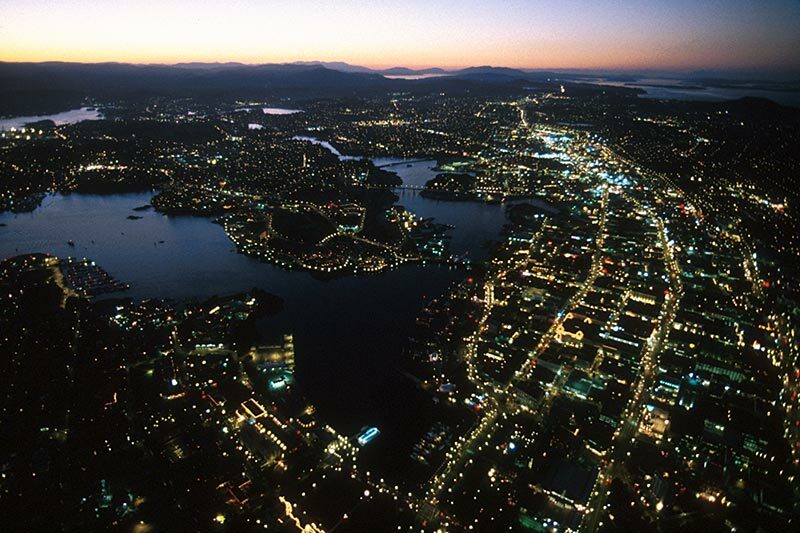 There is a rich diversity of landscapes within the region, ranging from the Douglas fir forests along the coast to the drier, exposed conditions of the higher, rockier elevations that support arbutus (madrona) and Garry oak forests. Victorians display their love for the natural world by cultivating flower gardens at every turn. As you’d imagine in a region where a large urban population interacts with such a delightful natural tableau, a vast network of walking, hiking, and biking routes leads through the many parks with which the city is blessed. It’s easy to imagine how sweet life was for Native Canadians who once had this all to themselves. 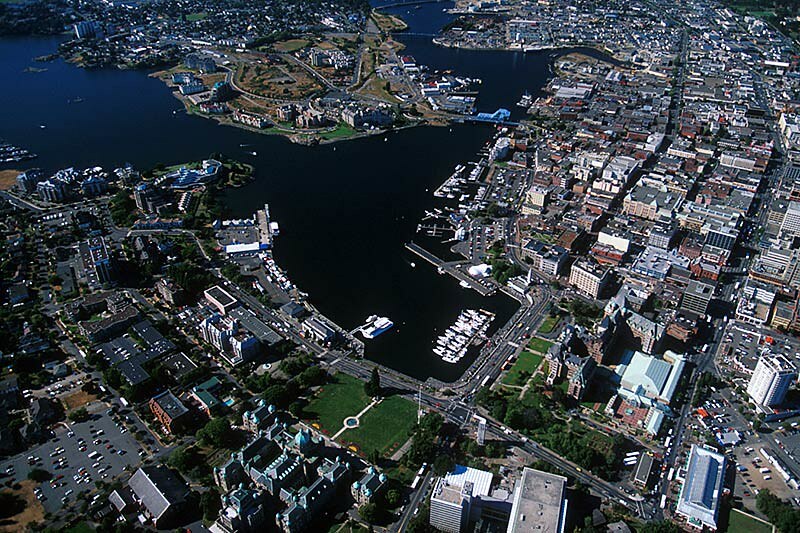 Beacon Hill Park in downtown Victoria was the site of a village that had been inhabited for thousands of years prior to the arrival of the colonial settlers in the 1840s. A tangled web of events since then has displaced the original dwellers, but their history is evident in the petroglyphs that adorn the shoreline and in the middens of seashells mounded up beside the beaches on the Strait of Juan de Fuca. Totem poles new and old stand as proud reminders of this First Nation heritage. 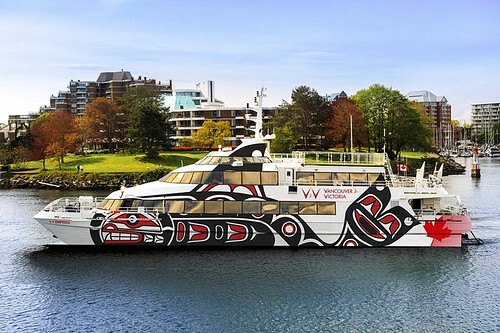 To gain a fresh appreciation for the talents and skills of First Nations peoples, combine a visit to the outdoors around Victoria with a stop at the Royal British Columbia Museum, a world-class repository of native artifacts. With the enriched perspective that such a visit will bring, you’ll look at the landscape with new interest and appreciation. The figures on the totems will no longer be static representations from a mythological age. Instead, combined with the presence of killer whales, seals, eagles, ravens, salmon, and other species that are as vibrant in the landscape today as they were in the past, you’ll enter a timeless realm and, in the process, discover a new place in nature for yourself. 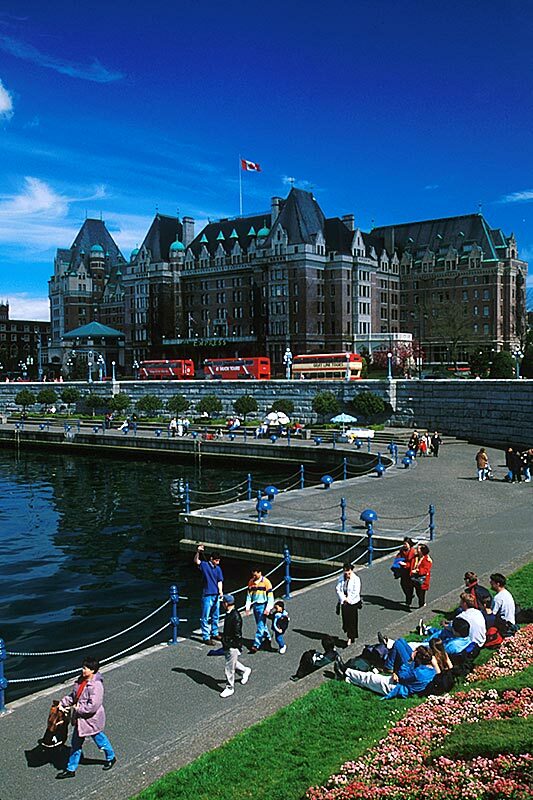 Conde’ Naste Traveler Magazine reader’s poll rated Victoria one of the top ten cities to visit in the world. The picture-perfect Inner Harbour is surrounded by many of Victoria’s beautiful character buildings and premier attractions: the stately Empress Hotel, the BC provincial Legislative Buildings, museums and galleries. 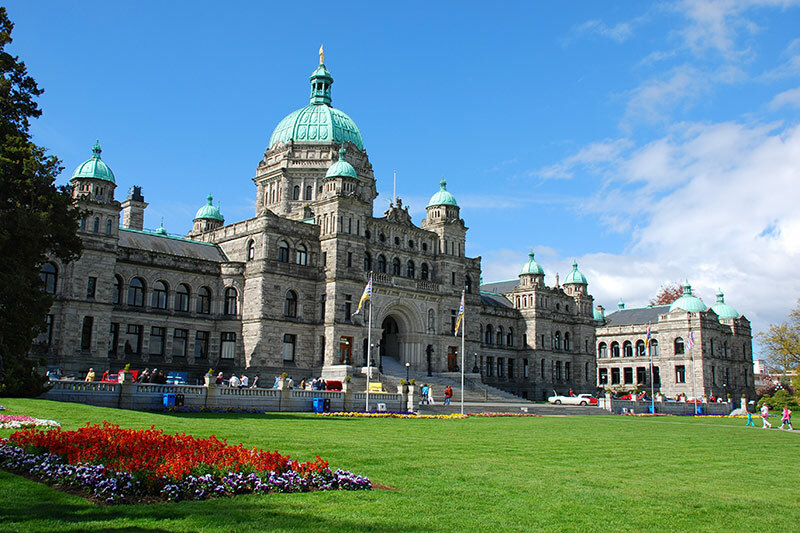 As romantic as Victoria may be, with its delightful natural harbour and the Olympic Mountains of Washington State on the horizon, the provincial capital of British Columbia is less a museum piece nowadays than it is a tourist mecca. Visitors pour in to view vast sculpted gardens and London-style double-decker buses, to shop for Irish linens and Harris tweeds, to sip afternoon tea, and to soak up what they believe is the last vestige of British imperialism in the Western Hemisphere. Location: Victoria is located on the southern tip of Vancouver Island, which is situated off the southwest coast of British Columbia. 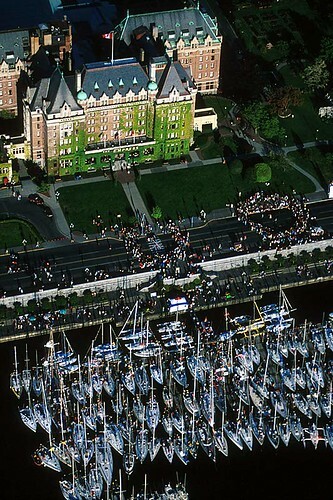 Visitors from the Lower Mainland of BC travel to Victoria by ferry from the BC Ferries’ Tsawwassen terminal in Delta. 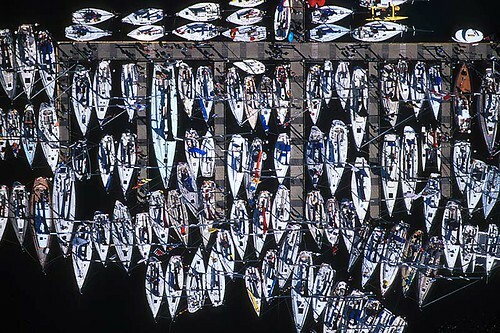 Sailing time is 90 minutes for the 27-mile (44-km) distance across the Strait of Georgia to the Swartz Bay terminal, 20 miles (32 km) north of Victoria. 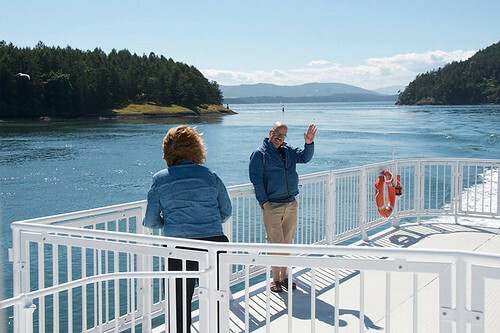 Visitors from the United States can journey to Victoria via ferry from Seattle, Anacortes in northwest Washington, or from Port Angeles on Washington’s Olympic Peninsula. The Anacortes ferry arrives in Sidney, at the Washington State Ferries terminal, 3 miles (5 km) south of Swartz Bay. The MV Coho from Port Angeles arrives in Victoria’s Inner Harbour, as does the Victoria Clipper from Seattle’s Pier 69. 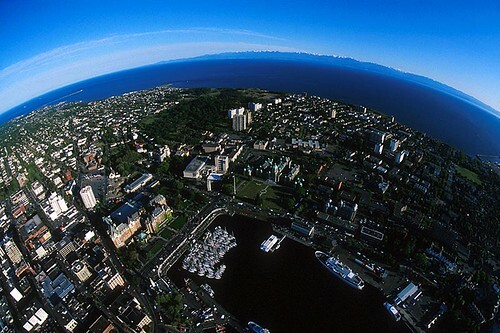 The Olympic and Saanich Peninsulas are separated by the Strait of Juan de Fuca, a 17-mile (27-km) stretch of (almost) open ocean. 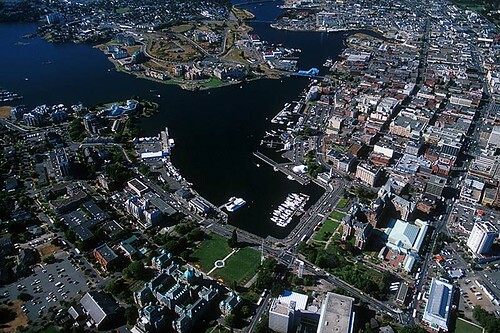 By air, visitors arrive at either Victoria Harbour (by float plane) or Victoria International Airport on the Saanich Peninsula, about 17 miles (27 km) north of Victoria. A coach service operates via BC Ferries between Vancouver and downtown Victoria (43 miles/69 km by road, excluding ferry travel). 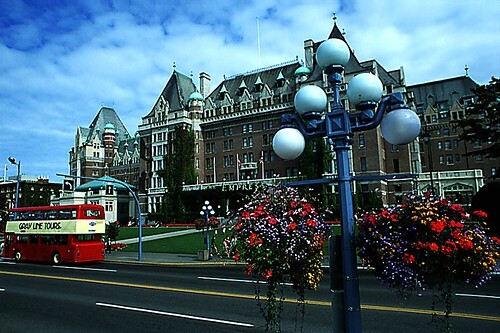 Pick-up is available from various locations in Vancouver, including Downtown Vancouver, Vancouver International Airport, and major hotels. Visit our Transportation section for further information. Victoria Weather: One of the glorious things about the Victoria region is that you can picnic, golf or hike here year round, something that much of the rest of the province has always envied. 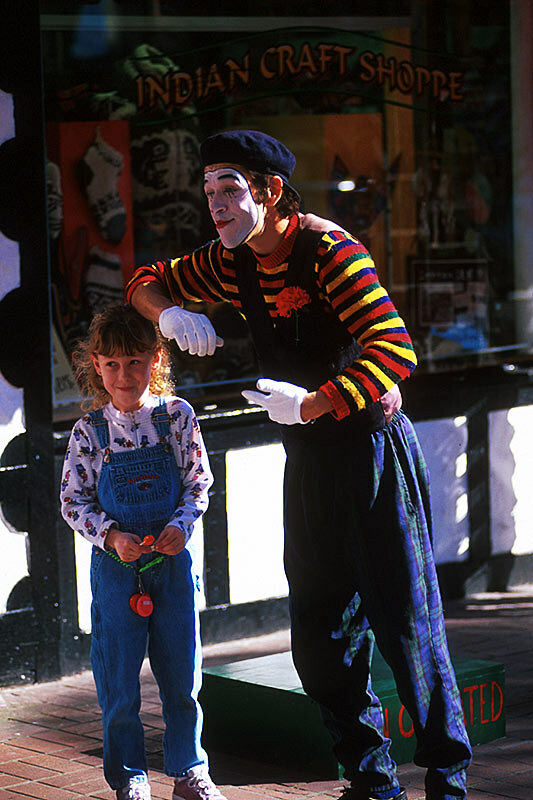 Each season has its unique character, and life is always assuming new forms. Spring and fall migrations of birds and fish animate the landscape. Evergreen forests brighten a winter landscape that otherwise lies unveiled once deciduous trees drop their summer foliage. Even snow makes the occasional appearance, though it rarely remains for long. Summer droughts and winter rains determine the songs sung by rivers and creeks. 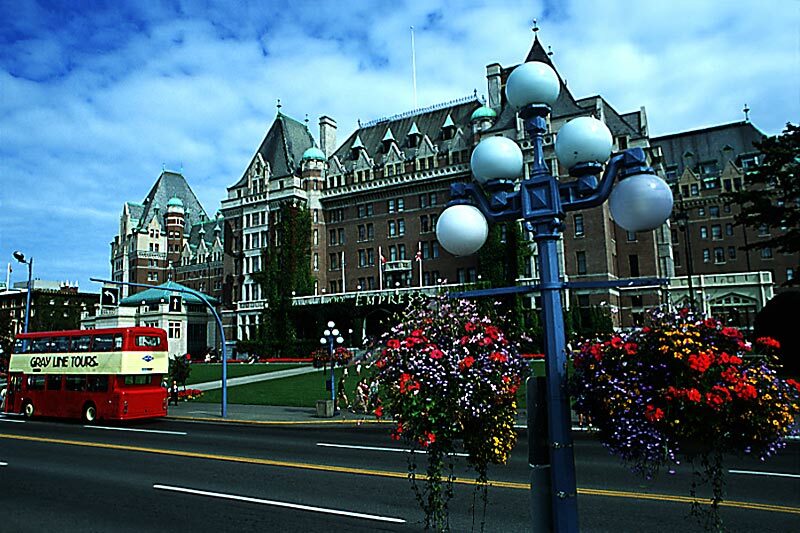 Hanging Flower Baskets adorn the city’s lampposts in a celebration of scent and bright colours, symbolizing Victoria’s passion for gardening. Flowers bloom year round in Victoria, which makes exploring the outdoors here enjoyable in any season. Ferns and lichens colour the forest floor throughout the winter; come spring, an explosion of trilliums and calypso orchids heightens the effect before giving way to bushes lush with huckleberry, salmonberry, trailing blackberry, salal, and Oregon grape. 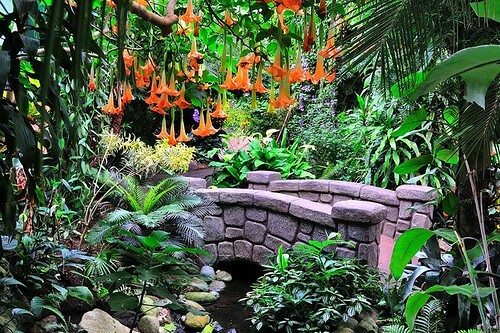 The Butchart Gardens are probably the best-known gardens in western Canada. Thousands of flowers are displayed in season each year in the Sunken, Rose, Japanese and Italian theme gardens. Breathtaking by day, the Gardens become a delightful fairyland on summer nights when illuminated by countless lights. 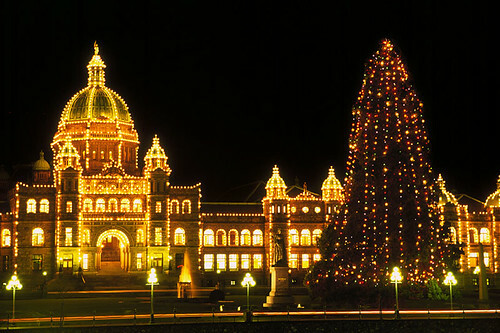 BC Legislature: If there’s a quintessential image of Victoria etched in the memory of all who visit the city, it must surely be British Columbia’s Legislative Buildings at night. Adorned with 3,333 light bulbs, it takes on a magical quality. 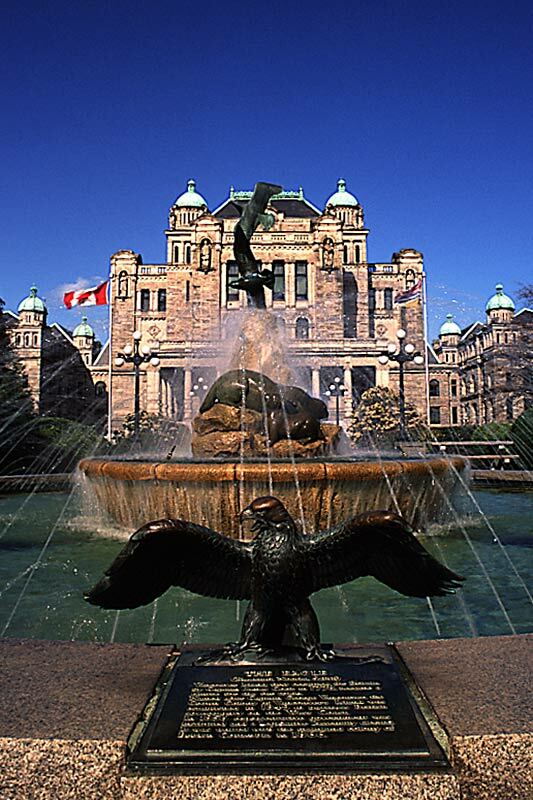 Take a free tour of the Legislative Buildings and learn about history and government of British Columbia. The ivy-covered Empress Hotel, overlooking Victoria’s Inner Harbour, has been a famous Victoria landmark since 1908. 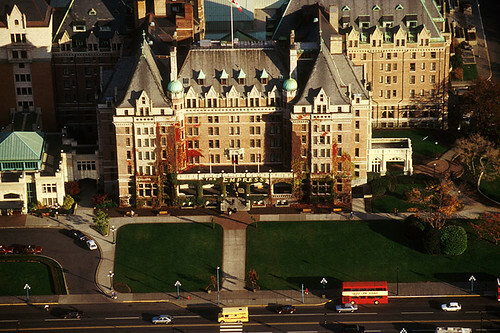 The Empress is known for serving afternoon tea in its elegant upper lobby, and for its beautiful public spaces, which are well worth seeing. The Royal British Columbia Museum is one of the finest of its kind in the world, offering dramatic dioramas of natural landscapes and full-scale reconstructions of Victorian storefronts. The museum features outstanding displays on the province’s artifacts, documents, history and culture, as well as national and international feature exhibits. Permanent Galleries include the First Peoples, Modern History and Natural History Galleries. The Maritime Museum of British Columbia allows visitors to explore BC’s seafaring history through more than 5,000 artifacts. 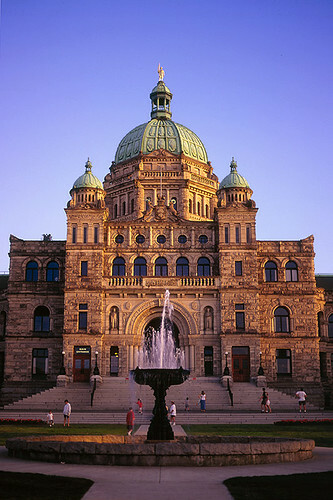 Exhibits include the fort and the city of Victoria, explorers and pirates, whaling and fishing, shipbuilding and shipwrecks, ship models and paintings, the Coast Guard and Navy, and the courtroom once presided over by the notorious Judge Sir Matthew Baillie Begbie in the late 19th century. Note that this museum is closed until further notice. The Robert Bateman Centre displays the definitive collection of Robert Bateman’s work. 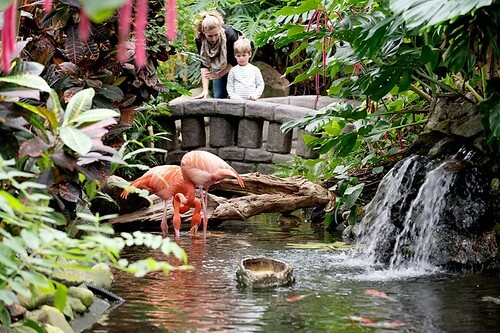 Through their collections, research, exhibits, and programming the centre encourages experiential learning, observation and dialogue, and inspires people of all ages to find their place in Nature. Experience the magic of nature through the eyes of Robert Bateman, one of Canada’s most celebrated artists and conservationists. His work brings attention to the beauty and destruction of our planet. 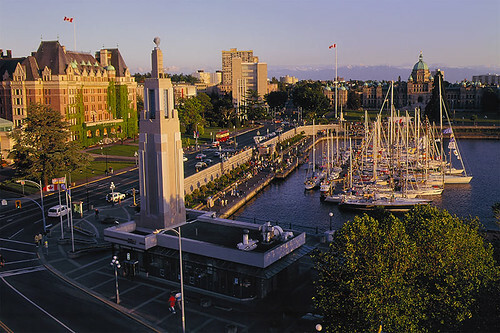 The Robert Bateman Centre is located at 470 Belleville Street, in the Steamship Terminal on Victoria’s Inner Harbour. The Union Club of B.C. 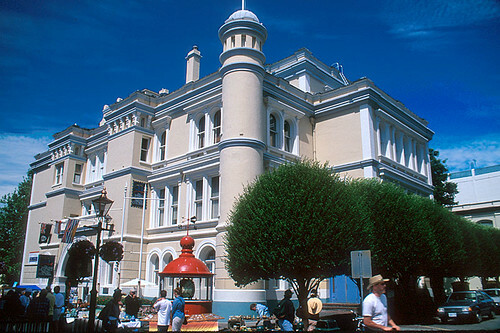 building is a national historic site located on the corner of Gordon and Humboldt Streets in downtown Victoria, opposite the Empress Hotel. The magnificent beaux arts Italian Renaissance-style building was completed in 1912. From the outside, its beige columns and brick exterior stand tall, while its high-arched windows offer a glimpse into life as a member of the B.C. 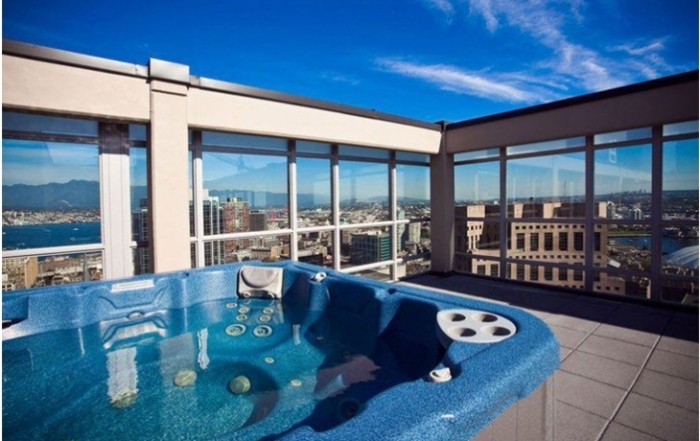 Union club. Old Town Victoria is the oldest section of Victoria, built up between the 1860s and the 1890s. 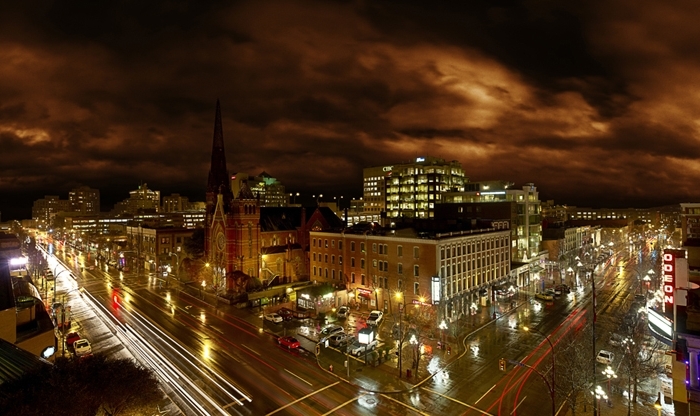 Explore Johnson Street and Chinatown, the galleries and sidewalk restaurants in Bastion Square, and historic Market Square, a restored 19th-century courtyard surrounded by three floors of charming heritage shops, restaurants, and offices. 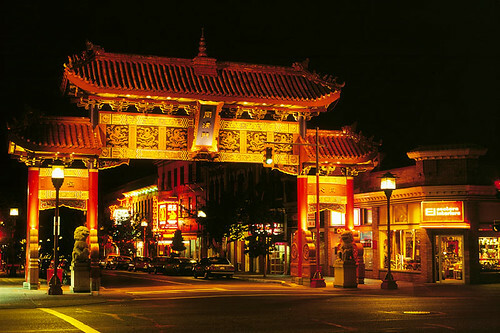 Chinatown: The splendid lion-bedecked Gate of Harmonious Interest marks the entrance to Victoria’s small Chinatown, the second oldest in North America (after San Francisco). Once a ghetto for newcomers, Chinatown is now a heritage area, a vibrant commercial community, and an intriguing part of Victoria’s past and present. Visit the tiny shops and studios on Fan Tan Alley, the narrowest street in Canada – only 90 centimetres wide at its narrowest. 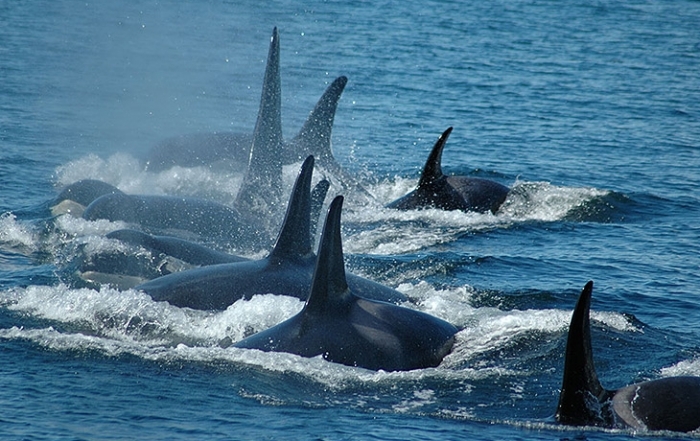 Whale Watching: Victoria is the ultimate destination for whale watching adventures with Orca (Killer) Whale pods, Humpback Whales, and Minke Whales. 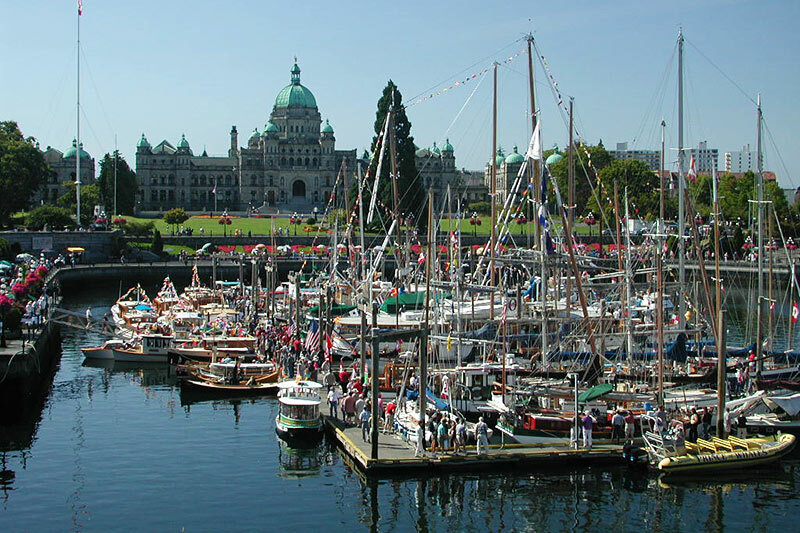 The Inner Harbour is the departure point for year-round whale watching trips, harbour cruises, kayaking tours, and fishing and boating charters. Carriage Ride: Relax in a horse-drawn carriage and capture the romance of an era when tall ships docked in the Inner Harbour. Private carriage tours include Old Town, Chinatown, Beacon Hill Park, heritage homes, and the Dallas Road waterfront. 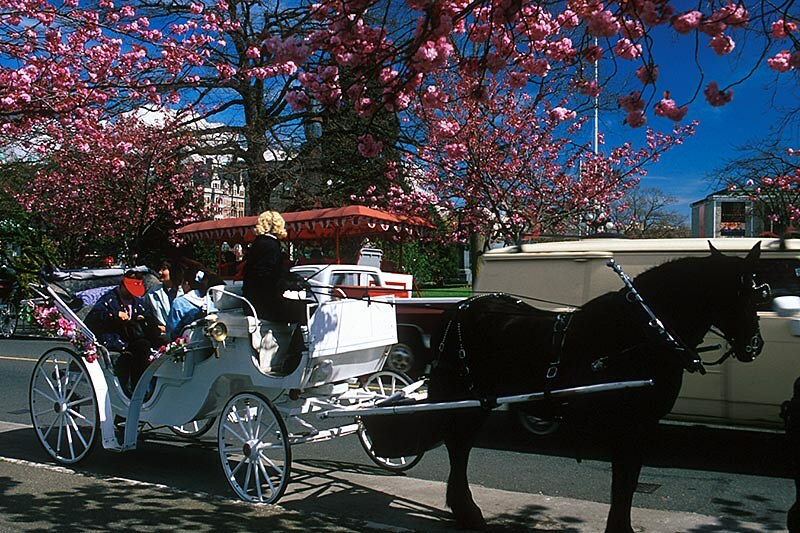 Fabulous horsedrawn carriages have been delighting visitors with rides through Victoria for over 100 years! Beacon Hill Park is an historic sanctuary in Downtown Victoria, with landscaped gardens, bridges, ponds, abundant wildlife, and spectacular views of the Olympic Mountains. A delightful quiet envelops this sunny spot, where walking trails link with neighbourhood streets that lead down into the busy hum of Victoria. Beacon Hill Park was the site of an ancient village inhabited for thousands of years prior to the arrival of the colonial settlers. 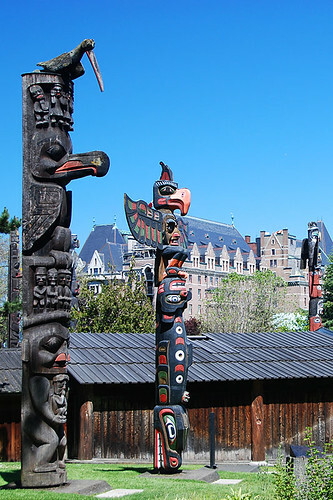 In 1956, renowned Kwakwaka’wakw artist Mungo Martin and his team raised the world’s tallest free-standing totem pole in Beacon Hill Park (38.8 metres/128 feet). Beacon Hill Children’s Farm is a hands-on petting zoo in Beacon Hill Park, enjoyed by kids and adults alike, with lots of baby animals, potbelly pigs, African pygmy goats, miniature horses, alpacas, rabbits and guinea pigs, a goat-petting area, and many other critters to meet and pet. Don’t miss the famous daily Goat Stampede at closing time! The farm is open seasonally. The National Geographic IMAX Theatre will delight you with crystal clear images and 12,000 watts of wraparound IMAX Digital surround sound. Six stories high and 81 feet wide, the IMAX screen pulls you in and brings images to life, letting you feel like you’re really there. Located inside the Royal BC Museum. Thunderbird Park, adjacent to the Royal BC Museum, displays an impressive collection of totem poles of the First Nations of coastal British Columbia. With the enriched perspective that such a visit will bring, you’ll look at the landscape with new interest and appreciation. 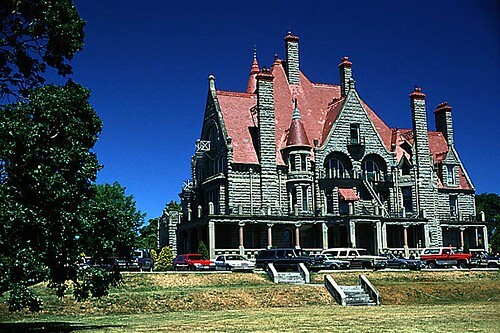 Craigdarroch Castle puts you back into an era of unfettered wealth and ostentation. Learn the fascinating history of this poor Scottish coal miner who built an empire and became the wealthiest and most influential man in British Columbia. Craigflower Manor and Schoolhouse was one of Vancouver Island’s first farming communities, established in 1853 along Victoria’s Gorge Waterway on lands purchased from chiefs of the indigenous aboriginal people. Point Ellice House was acquired as a waterfront estate in 1867 by Gold Rush magistrate and commissioner Peter O’Reilly. An audiotape tour is offered and you’ll see an amazing collection of Victoriana in its original setting. High Tea, served until 4pm, is a favourite here! 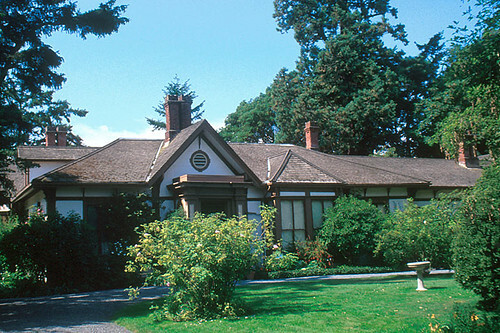 Emily Carr House is the birthplace of Emily Carr, one of Canada’s first and best known independent artists and writers. Enter into the same ambiance her family knew in the 1870s, and see some of her early pottery and sculpture. Helmcken House was built in 1852 for pioneer doctor John Helmcken, and is now the second oldest residence on its original site in BC. Dr. Helmcken’s library, medicine chest, and medical instruments make up one of Canada’s finest 19th-century medical collections. Fascinating audiotape tours will guide you through a house full of intriguing legacies. The Art Gallery of Greater Victoria houses one of the world’s finest collections of Asian art, with special historic and contemporary exhibits on display throughout the year. An Asian garden located on the grounds includes the only authentic Japanese Shinto shrine in North America. 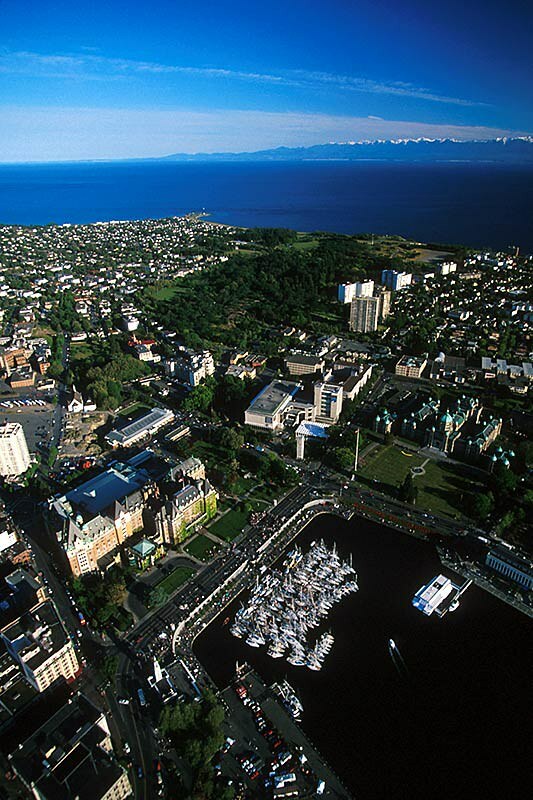 Victoria Gardens: The mild climate and profusion of green thumbs has earned Victoria the title City of Gardens. Created by Prince and Princess Abkhazi in the mid to late 1940s, Abkhazi Garden features native Garry oaks, ornamental evergreens, rhododendrons, rock and alpine plants, naturalized bulbs, Japanese maples, and weeping conifers. Finnerty Gardens, a three-acre University of Victoria garden, is home to more than 200 rhododendron species and azaleas. 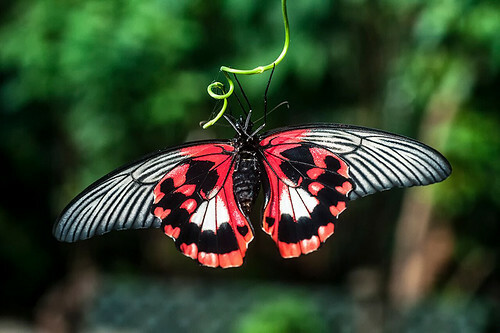 Beauty and education combine at the 44-hectare Horticulture Centre of the Pacific, a fascinating place with demonstration gardens, display gardens, and woodlands. Government House and Gardens: Government House is the estate of the Lietenant Governor of British Columbia, the Queen’s representative in British Columbia. Government House is a national historic site embracing 36 acres, including rare Garry oak woodlands and ornamental gardens in various styles. 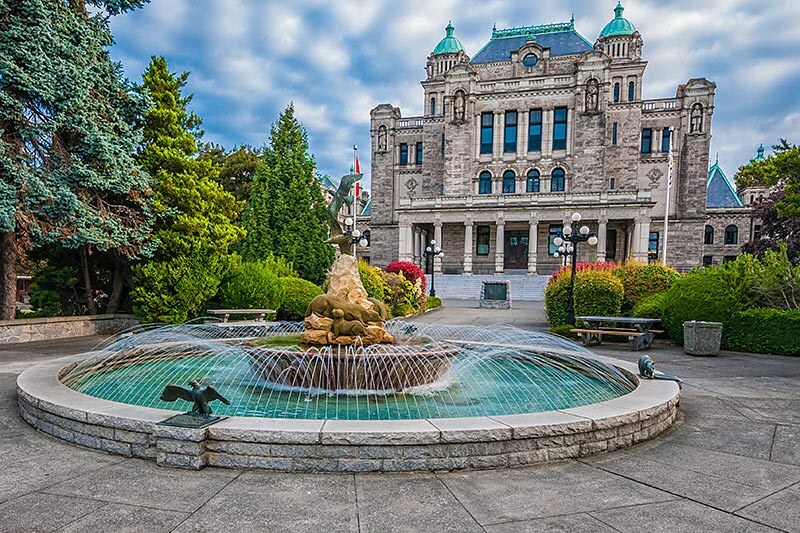 Government House is located in the heart of the Rockland neighbourhood in Victoria, at 1401 Rockland Avenue, a 5-minute drive or 20-minute walk from downtown. With occasional exceptions, the grounds are open daily free of charge to the public from sunrise to sunset. Visit and enjoy a cup of tea at the interpretative centre, Tuesday to Saturday from May through September. 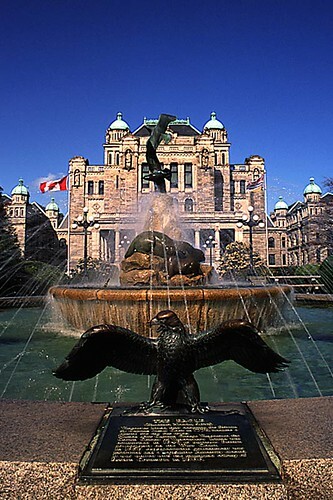 www.ltgov.bc.ca. Hatley Castle: Tour the gardens at Hatley Park National Historic Site, the luxury estate of industrialist and former BC premier James Dunsmuir. Hatley Castle and grounds are now home to Royal Roads University. The university and gardens are surrounded by an urban forest containing elements of all biotic zones of Vancouver Island, except alpine and coastal rain forest. The campus area borders on a saltwater lagoon, which is a bird and wildlife sanctuary. Regimental Museum: The Canadian Scottish Regiment (Princess Mary’s) is Vancouver Island’s own Military Infantry Unit, and traces its origin to the 88th Regiment (Victoria Fusiliers) raised in 1912 and the 50th Regiment (Gordon Highlanders), raised in 1923. The Regimental Museum displays medals, uniforms, weapons and publications housed in the Bay Street Armoury, 715 Bay Street at Blanshard, Victoria, a 10-minute walk from the Inner Harbour. 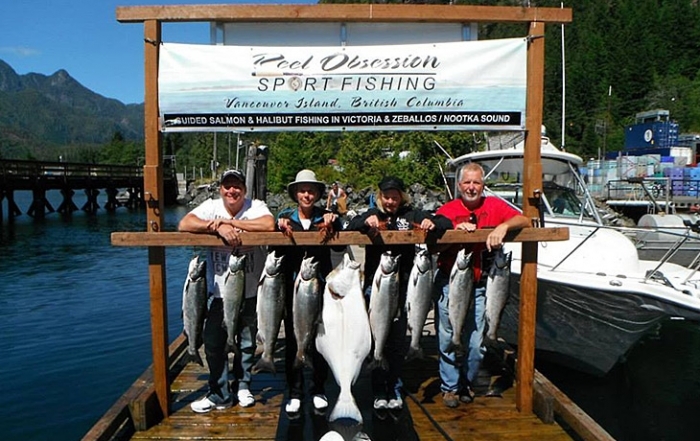 Call 250-363-8753 for viewing hours and pre-arranged viewing for groups and families. Ross Bay Cemetery is a superb example of a Victorian-era burial ground, and is the final resting place of many famous Canadians, including Sir James Douglas, the first governor of British Columbia, artist Emily Carr, coal baron Robert Dunsmuir, who built Craigdarroch Castle, Matthew Baillie Begbie, the hanging judge, and Billy Barker, whose discovery sparked the Barkerville Gold Rush. Located off Dallas Road near Oak Bay. Dominion Astrophysical Observatory on West Saanich Road is a major institute for astronomy. A dome houses a 1.8-metre-aperture telescope, once the largest in the world (1918). The Centre of the Universe interpretive centre has a 16-inch telescope and displays about the planets, the different types of stars and galaxies, and Canada’s role in discovering things in our cosmos. The centre also has a theatre for presentations on astronomy. Bikers challenging the steady 5-6% climb to the summit are rewarded with panoramic views of southern Vancouver Island. Note: Due to budget cutbacks, the Centre of the Universe will be closed to the public for good at the end of the summer 2013. Fisgard Lighthouse is Canada’s oldest West Coast lighthouse, built in 1860. Step inside this working lighthouse, where you’ll find colourful artifacts and display panels about shipwrecks and the lives that were saved. At the same location is Fort Rodd Hill, built 1895-1900, which featured gun batteries to protect the navy base at Esquimalt Harbour. Stroll the ramparts of the three coastal batteries, look down the barrels of the original guns, explore underground magazines, and discover camouflaged searchlight emplacements. 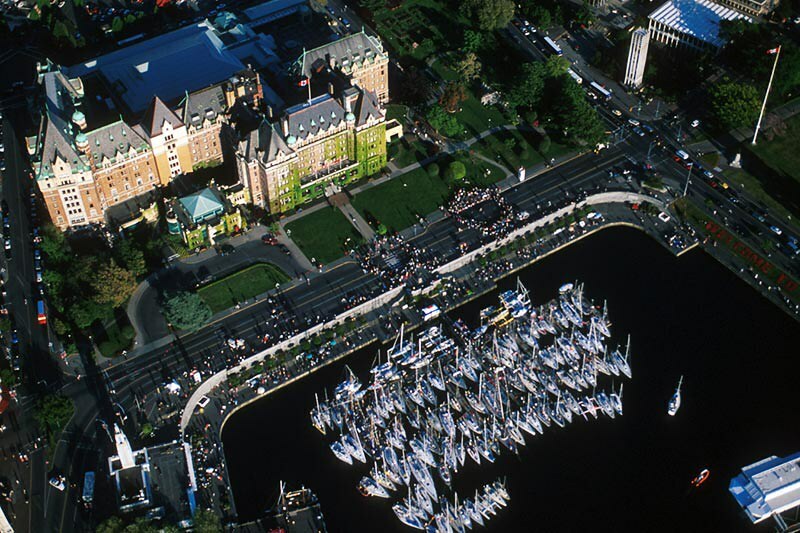 The Gorge is a meandering waterway that leads from Victoria’s upper harbour through a landscaped urban environment, before finally widening into Portage Inlet. 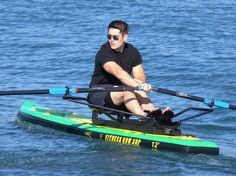 A daily tidal surge occasionally creates near-whitewater conditions in the narrowest passages, a thrill that kayakers will particularly enjoy. 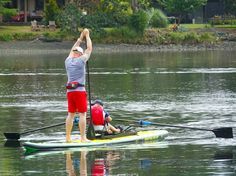 The best place to launch is the dock at Gorge Park, just west of downtown Victoria. 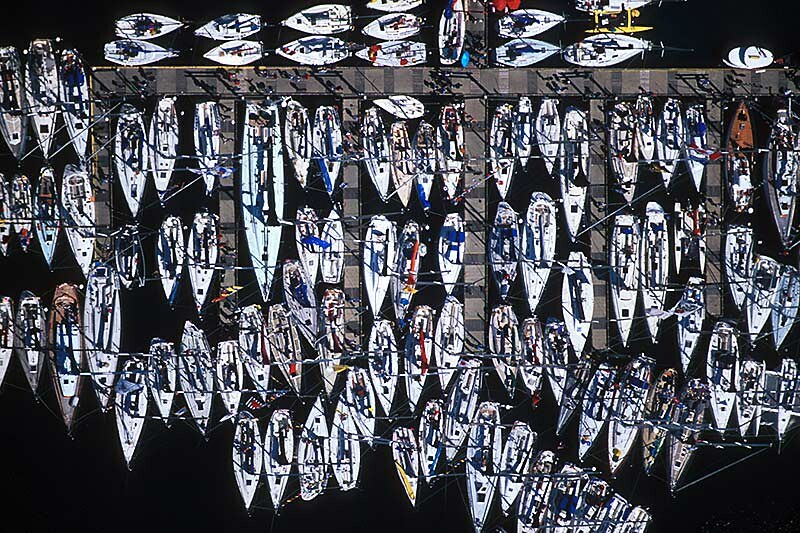 There’s more paddling here than you can explore in one day, which guarantees a return visit. Next to the fall salmon run at Goldstream Provincial Park, the spring herring run in the Gorge waterway is one of the major events of the year in local waters, with the bonus that the fat, sardine-like fish are easier to catch. Ogden Point: The breakwater at Ogden Point in James Bay, at nearly 800 metres long, extends into the ocean and offers a unique opportunity to walk out to sea and enjoy great views in all directions. Completed in 1916, and named after Peter Skeene Ogden, a noted 19th-century office of the Hudson’s Bay Company, the return walk takes about 40 minutes. With no railings on either side, the walkway is not recommended for those suffering from vertigo, and parents should monitor young children. Winter storms conditions demand additional caution. Fisherman’s Wharf: Just around the corner from Victoria’s Inner Harbour and the Ogden Point cruise ship terminal, Fisherman’s Wharf is a hidden treasure waiting to be discovered. 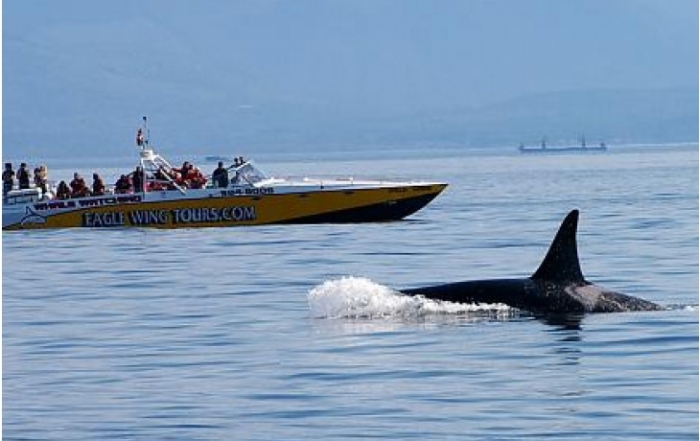 This unique marine destination offers eco-tour adventures in the heart of the working harbour, including whale watching and wildlife-viewing tours, kayak rentals and fishing charters. 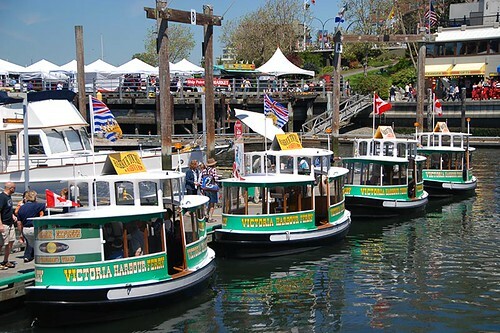 Wander down the docks with your lunch, buy seafood fresh off the boat, see moored pleasure vessels and float homes, and watch as fishing vessels unload their catches. Victoria Public Market: The Victoria Public Market at the Hudson highlights local food producers at every level: farmers, fishers, butchers, bakers, cheese-makers, preservers, brewers, vintners, florists and restaurateurs. Victoria Public Market is located at 1701 Douglas Street, Victoria. Visit their website for the hours of operation for the Public Market and Farmers’ Markets. 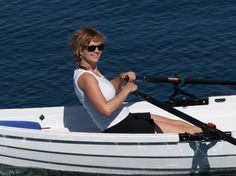 www.victoriapublicmarket.com. Trails: As you would imagine in a region where a large urban population interacts with such a delightful natural tableau, a vast network of walking, hiking and biking routes leads through the many parks with which Victoria is blessed. Although the mountainscape on southern Vancouver Island is not as rugged as the North Shore mountains that rise above Vancouver, this actually mitigates in favour of hiking in Victoria, as the physical demands for reaching the viewpoints are not as great. 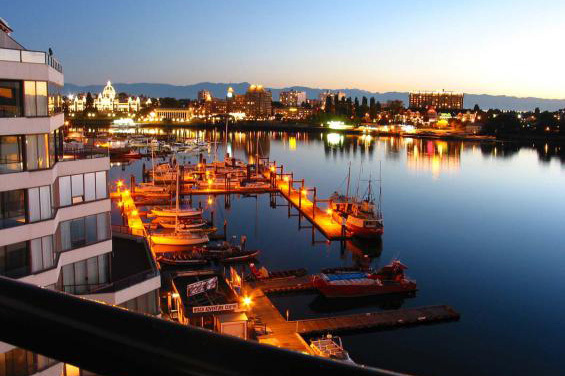 On the other hand, the views are as panoramic and breathtaking as anywhere in British Columbia. Hiking: Just as Victorians can be proud of their 37-mile (60-km) Galloping Goose Trail and the Lochside Trail, two popular commuter walk and cycle trails, so too can they brag about the beauty of the Coast Trail, a 10-km trail that runs beside the Strait of Juan de Fuca in East Sooke Regional Park near Victoria. 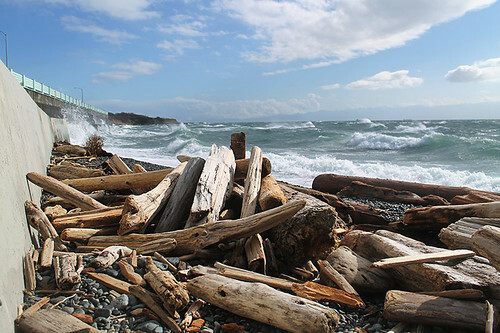 The Coast Trail and the Juan De Fuca Marine Trail in Juan de Fuca Provincial Park are ideal testing grounds for a longer journey such as the West Coast Trail between Port Renfrew and Bamfield. Golf: Victoria boasts 8 championship golf courses in close proximity, including Arbutus Ridge Golf Club, Cordova Bay Golf Club, Olympic View Golf Club, Gorge Vale Golf Club, Royal Colwood Golf Club, and Bear Mountain Golf and Country Club. 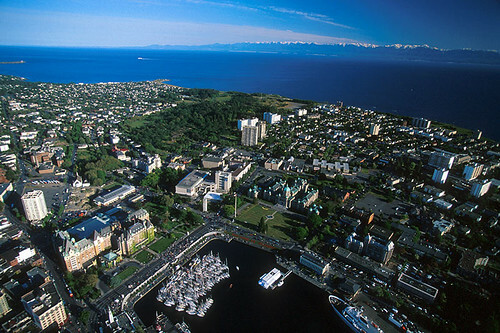 Nearby Oak Bay has the Uplands Golf Course and Victoria Golf Club. Victoria Golf Vacations. 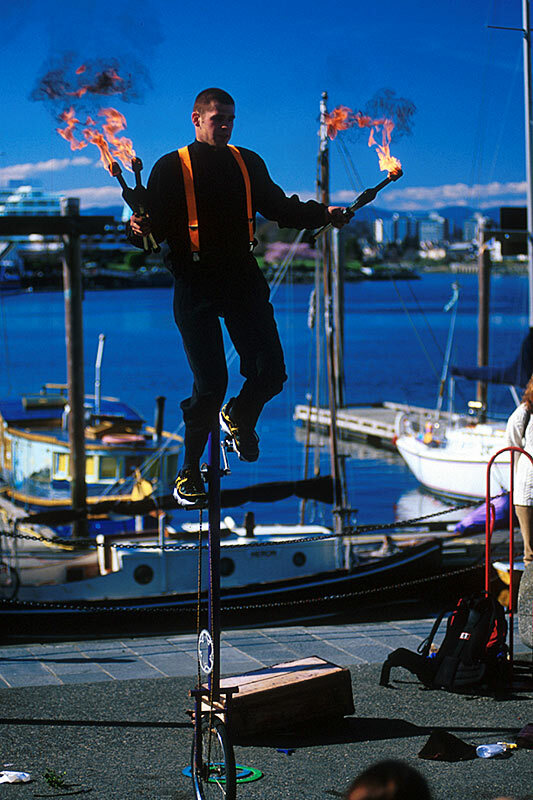 Diving: There’s plenty of diving action around Greater Victoria. Much of the diving activity is based out of Ogden Point in Downtown Victoria, with diving in the marine sanctuary right off the Ogden Point Breakwater. Dive sites include Race Rocks in the Strait of Juan de Fuca, HMCS Mackenzie off Gooch Island, and the GB Church off Portland Island. You can also dive out of Sidney, at the northern end of the Saanich Peninsula, and Brentwood Bay in the Saanich Inlet, where an artificial reef is slowly taking shape offshore. Bird Migration: The Pacific Flyway is a major north-south route of travel for migratory birds in the Americas, extending from Alaska to Patagonia. The profusion of flora is a reward for migrating birds that make the Victoria region a semi-annual stop-over point. Bald eagles, ospreys, turkey vultures, herons, shorebirds, belted kingfishers, dippers, winter wrens, and many species of migratory ducks, geese, and swans flock to the delightfully benign environment. Llamas: Greater Victoria has a number of popular Llama farms, where beautiful and charismatic llamas have a therapeutic effect on visitors who feed them, photograph them, cuddle them, and sit, talk and walk with them. It’s nearly impossible to sit quietly with a llama and not find yourself engaged in their special magic. Lodgings on llama farms add an extra dimension to an already pleasant stay in British Columbia. Llama Walks and Llama Hiking. Provincial Parks: Throughout the 1990s, a string of new parks were set aside in the Capital Region District (CRD), including the almost 3,000-acre (1,200-hectare) Gowlland Tod Provincial Park and Goldstream Provincial Park beside the Goldstream River, where thousands of nature-loving onlookers visit the park during the fall salmon migration to watch the fish spawn and expire. The very first property to be donated to the BC provincial park system – John Dean Provincial Park – is located on Greater Victoria’s Saanich Peninsula. 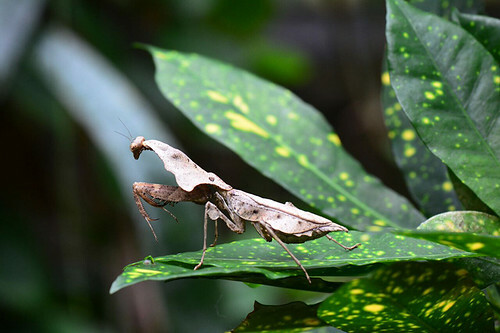 Horticulture Centre of the Pacific (HCP): The Gardens at HCP feature 9 acres of spectacular gardens showcasing over 10,000 varieties of plants. Thirty-four different areas are designed and planted to demonstrate landscaping techniques suitable for the Pacific Northwest. The centre has a horticulture library with over 2,500 landscaping and garden-related books and magazines. HCP is located at 505 Quayle Road, Victoria. Visit the website for hours and admission charges. www.hcp.ca. 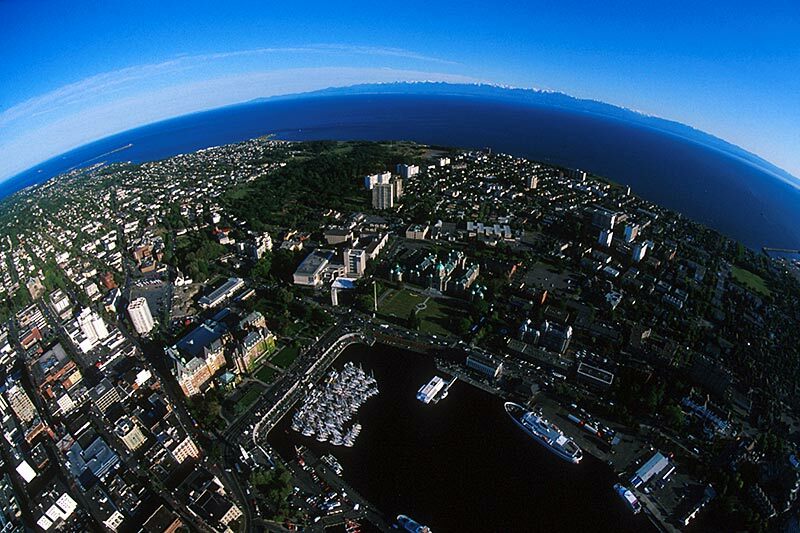 Scenic Drives: One of the most recommended drives in Victoria is the Scenic Marine Drive, which follows the coastline and leads through some of Victoria’s most beautiful residential areas, affording stunning views of the Pacific Ocean and the Olympic Mountains. 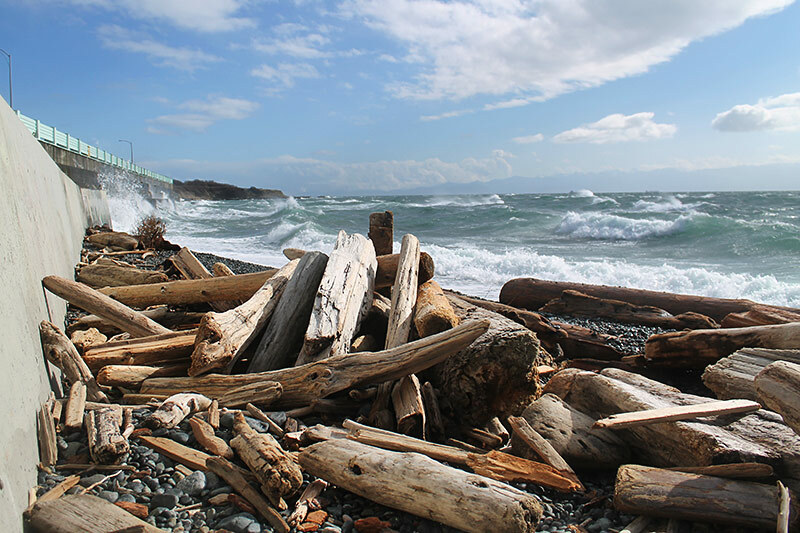 Beginning at the southwest corner of Beacon Hill Park, follow Dallas Road along the coastline, stopping at any of the numerous parking areas to take in the views. Along the way, Dallas Road’s name changes to Beach Drive and continues into the Oak Bay neighbourhood. 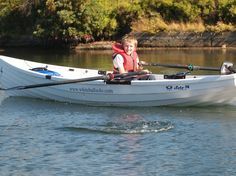 The Oak Bay Marina offers visitors the opportunity to feed wild seals and offers an array of unique marine adventure options. Carry on to the exclusive neighbourhood of Uplands, the location of the Uplands Park and the Cattle Point lookout. 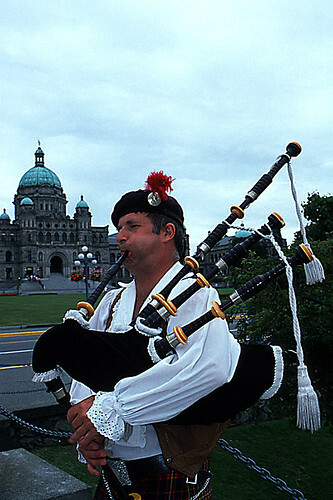 Festivals & Events: An exciting schedule of annual music and theatre festivals take place in Victoria throughout the year, including the Victoria Jazzfest International, the Shakespeare Festival, Victoria Rootsfest Music Festival, the Sooke Festival of Performing Arts, Symphony Splash, and the Victoria Fringe Festival. Victoria’s entertainment scene also offers a year-round choice of music, dance, and drama, including performances by Victoria’s own symphony, opera, theatre, and dance companies. 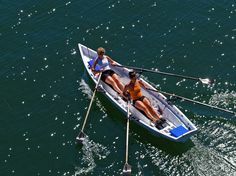 North of the city of Victoria and its adjoining municipalities of Saanich, Oak Bay and Esquimalt, lies the pastoral landscape of the Saanich Peninsula, where farms and pocket communities blend with forests, lakes and parks. 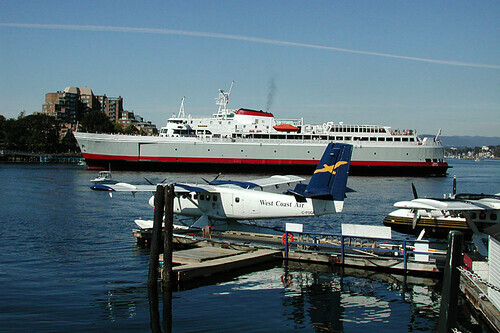 Surrounded on three sides by coastline and sheltered waters, the Saanich Peninsula is home to Victoria International Airport and the Swartz Bay Ferry Terminal (victoria/Vancouver). 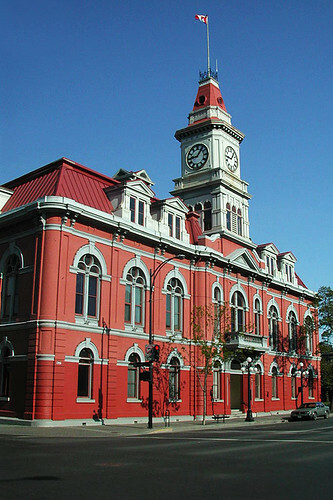 West of Victoria, the scenery of parks, marinas and residential neighbourhoods in the Western Communities (View Royal, Langford, Colwood and Metchosin) becomes progressively wilder as you enter the Sooke region and travel along the rugged shoreline, past coastal rain forests and windswept beaches. 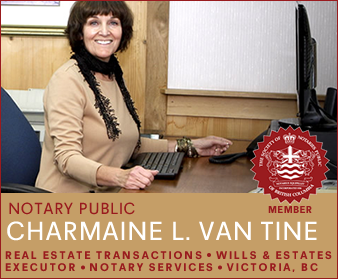 Charmaine Van Tine was commissioned as a Notary Public in 1990, with extensive background in mortgage and land development, and real estate conveyance. Over the past two decades, Charmaine has assisted thousands of clients with their real estate and estate planning requirements. Charmaine’s understanding and compassion to her client’s needs have been well received, resulting in many clients returning for additional services. 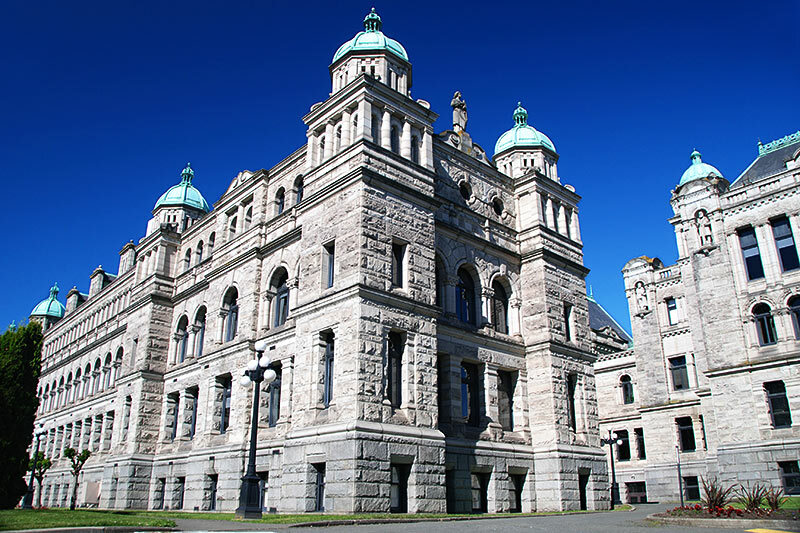 British Columbia Notaries are unique legal advisors that are highly trained in the provision of numerous non-contentious services, including land law and all the important personal planning tools available to the people of our province. The more common services we provide include Real Estate Conveyancing (Buying, Selling, Refinancing), Mortgages, Manufactured Home Transfers and Mortgages, Executorships, Powers of Attorney, Representation Agreements, Statutory Declarations, Travel Documents, and Wills, Affidavits and Notarizations. 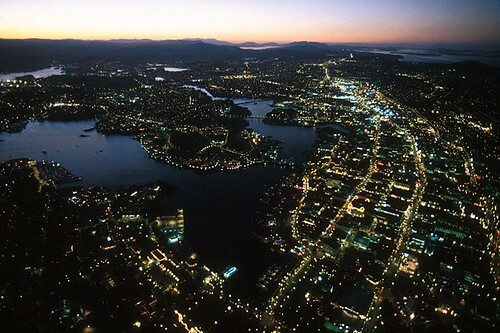 From our office in beautiful Brentwood Bay, we serve Brentwood Bay, Saanich, Saanichton, the Saanich Peninsula, Victoria, Sidney, Langford, Colwood, and the Southern Gulf Islands (Pender Island, Galiano Island, Mayne Island, and Salt Spring Island).